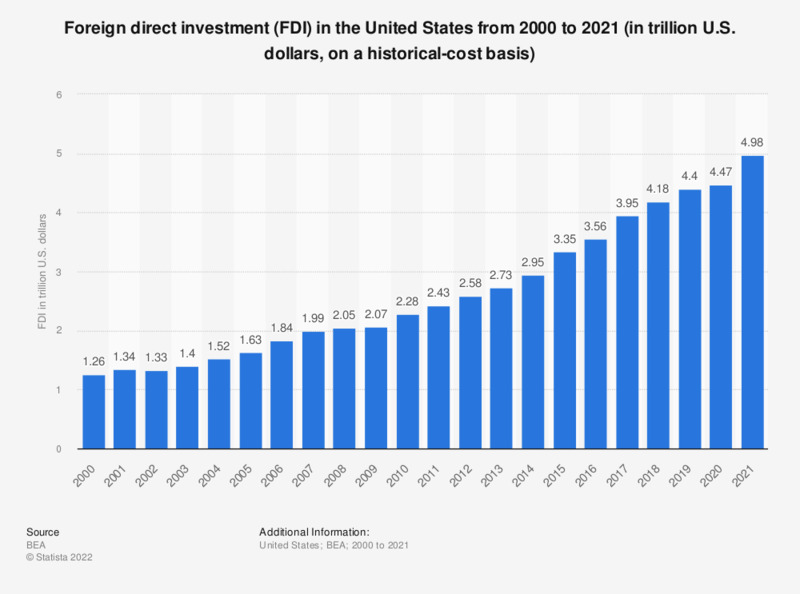 This statistic shows the value of foreign direct investment (FDI) in the United States from 2000 to 2017. In 2017, the total foreign direct investments in the United States amounted to approximately 4.03 trillion U.S. dollars. Foreign Direct Investment (FDI) is an investment from a company in one country into a company or entity located in another country. In this case direct foreign investment is shown for companies/entities located in the United States. In the last 17 years, the amount of FDI in the United States has more than doubled. In 2000, FDI was 1.26 trillion U.S. dollars and in 2017 it had risen to 4.03 trillion U.S. dollars. In 2017, the United Kingdom, Japan and Luxembourg invested large amounts of money in different companies or entities in the United States. The United Kingdom alone invested over 540 billion U.S. dollars in the United States that year. The United States is attractive when it comes to foreign investment inflows, as it is currently ranked second, after Singapore, in a list of the 20 most attractive foreign markets worldwide according the investment and free trade Index. However, while the United States receives huge amounts of FDI each year, it also invests even greater amounts in other countries. For example, in 2017 the United States invested over 936 billon U.S. dollars in the Netherlands and another 747 billion U.S. dollars in the United Kingdom. Other countries invested in the United States that same year. In fact, the United States has almost tripled the FDI outflows of any other country in the world. Direct investment implies that a person in one country has a lasting interest in, and a degree of influence over the management of, a business enterprise in another country. For the United States, in accordance with international guidelines, ownership or control of ten percent or more of an enterprise's voting securities, or the equivalent, is considered evidence of such a lasting interest or degree of influence over management. Thus, foreign direct investment in the United States is ownership or control, direct or indirect, by one foreign person of ten percent or more of the voting securities of an incorporated U.S. business enterprise or an equivalent interest in an unincorporated U.S. business enterprise. Everything On "Foreign Direct Investment in the U.S." in One Document: Edited and Divided into Handy Chapters. Including Detailed References. Statistics on "Foreign Direct Investment in the U.S."